Welcome to the Tesla club! Your new Tesla Model 3 is already perfect off the showroom floor, but there are a lot of things you can buy to make your car even better and more practical. We've surveyed thousands of customers and curated the Ultimate Guide for Tesla Model 3 accessories. It doesn't matter if you have the performance, short-range or long-range. You're part of the Tesla family now. 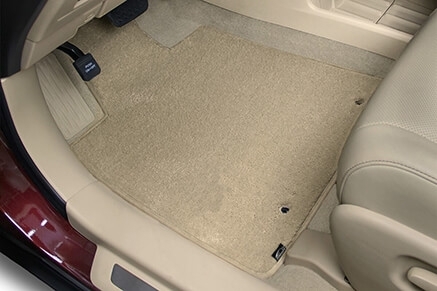 You probably have a few hundred (or a few thousand) miles by now, and are wondering how you can upgrade your floor mats, or how you can charge your cell phone. We're gonna help you do just that. By far the most popular and well received floor liners available for the brand new Tesla Model 3. These are custom fit to the contours and provide more dead pedal coverage than leading brands. We have been selling MAXpider floor liners for several years - we can say, without a doubt, these liners are well worth the money spent. They are designed to last years and provide a simple, understated but elegant look that's PERFECT for the Model 3. The Tesla Model 3 trunk is huge, so you're probably packing a lot in it. 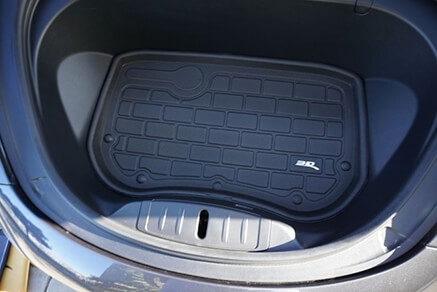 Make sure it's protected with a custom fit trunk liner. Carry food, drinks, potted plants... it doesn't matter. If there's a spill, just take the trunk liner out of the car and hose it off! Not everyone needs frunk protection, but in case you do MAXpider has you covered here. This small liner fits perfectly in the frunk space, providing a raised edge and protection for whatever cargo you like to put in your frunk. 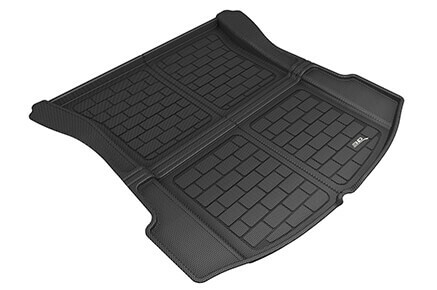 For more economical needs the Lloyd NorthRidge rubber floor mats may be what you need. 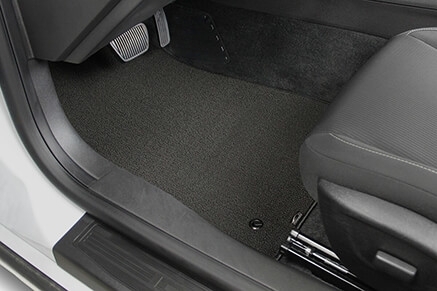 These are cheaper than other custom floor liners, though they are a bit more 'rugged'. 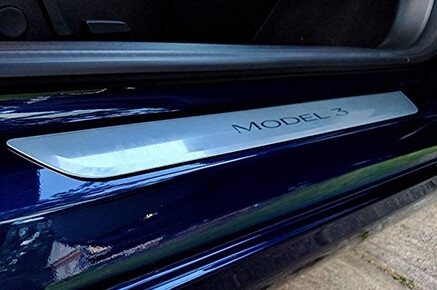 While these do not have raised edges, they are still cut to the contours of your Tesla Model 3. It features a 'raised weave' pattern which does help divert messes and spills from getting on your carpet. These come in 8 colors and are available for the front, rear, trunk, frunk and small deck. 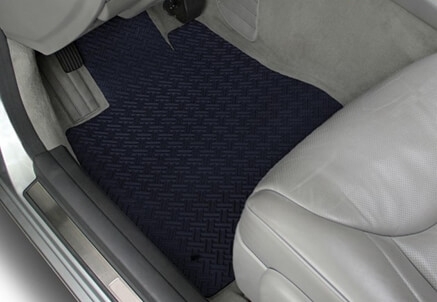 If you're looking for some carpet floor mats that are more durable than the Tesla floor mats, these looped carpet floor mats are a great option. Looped carpeting is a bit different than your standard cutpile carpeting. Looped carpeting was very popular on early model automobiles (prior to around 1970) and are highly durable. 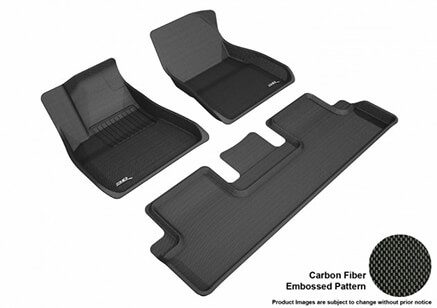 These carpet mats come with edge binding and are cut specifically to provide optimal & custom coverage in your Model 3. When it comes to standard cutpile carpeting, the Lloyd Ultimat line is the best value for the dollar. These are, by far, the most popular and highest quality cutpile carpet floor mats on the market. Available in over 30 different colors, the best part is that you can choose an accented 'premium' edge for a small additional fee. So, for example - if you drive a red Tesla, a nice look is to get black carpet mats with premium red binding. 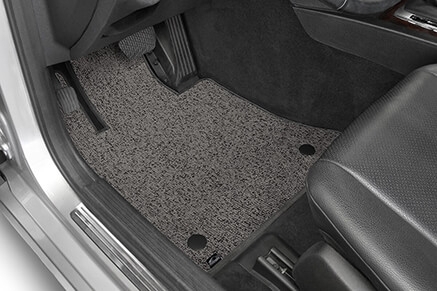 This puts a red border around your black mats, letting your vehicle's interior complement the exterior. Berber carpeting is usually what you see when you walk into a commercial or business establishment. It's designed for high traffic usage, is highly durable and is long lasting. These berber mats come in 9 color options including a black heathered option, which is black a 'speckled' look. The black heathered carpet mats is one of the most popular color options. If luxury is the name of your game, this is for you! 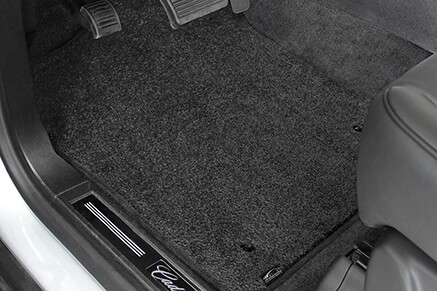 These are the most plush carpet floor mats available anywhere, designed for true luxury. 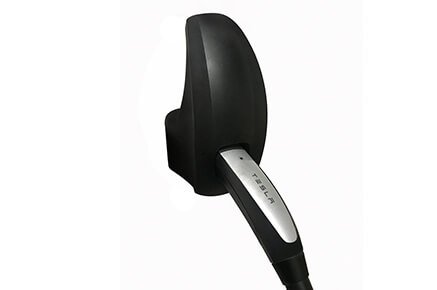 These are popular on luxury vehicles, including the Model S, Mercedes, BMW, etc. For an optional fee you can also choose to have an engraved leather patch added to these plush floor mats. This logo decal bundle helps to add both protection and style to the logos on your Tesla Model 3. Available in Carbon Fiber, Gloss Red, Matte Black and Satin Black, this bundle helps create a uniform and unique look across your car. This is a great option if you are trying to 'chrome delete' your vehicle. This vinyl protection film will help protect your dill sill from unavoidable scuffs and scratches. It uses 3M Scotchgard Pro Material, which is designed to 'self-heal' - meaning small scratches will disappear automatically. This can be installed in about 5 minutes and is an awesome, easy way to protect your car. Though this is Ford touch-up paint, Tesla owners say this is a pretty close match for the standard dark gray rims. This is a great solution if you just want an easy way to hide a scratch. Keep in mind, this isn't an exact match to your Tesla wheels, and shouldn't be used over a large area. But, it's a quick, cheap and easy way to help hide small scratches. 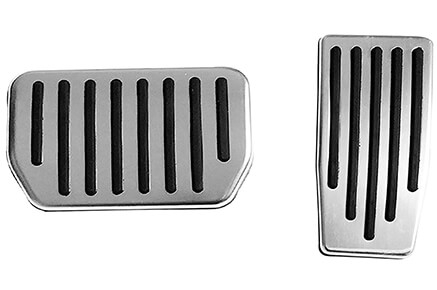 These aluminum pedal covers increase the foot size of the gas and brake pedals, and gives your Tesla Model 3 a better appearance. 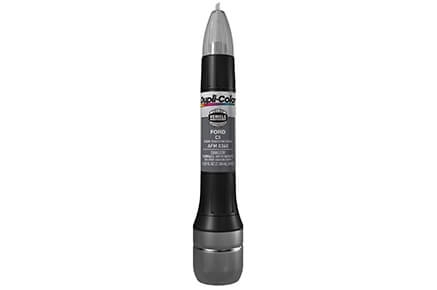 They feature a no-slip surface and are easy to install without any drilling. These are custom made for the Model 3. 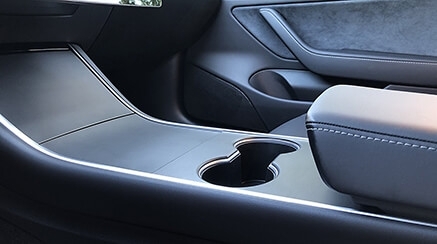 The center console area can be easily scratched with rings, jewelry, phones, and anything else that will hit it. These console wraps not only protect the console from these scratches, they can also help customize the look of your interior. This matte black option is perfect for people that want to keep a simple profile but still want to protect their interior center console. Includes: two cup holder wraps, one center wrap, one top wrap, two plastic installation blades, one metal razor blade in wax paper, one 6x7 microfiber, a wipe and instruction card for install information. Pretty much the same as the above, the only difference is the look. This has a unique brushed metal look, rather than the standard matte black. This is great for people that want a bit more of a unique look, but still want that understated Tesla simplicity. Because you know you'll need it. 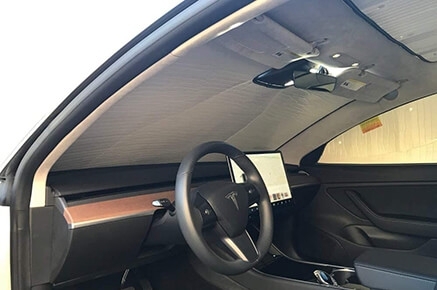 This safe, non-toxic screen cleaner is designed to be used on your electronic screens, so it's a perfect way to clean up your Tesla center screen from finger prints, smudges and other dust. Keep this around your house for all your other screens as well - you know you have at least a couple screens in every room! 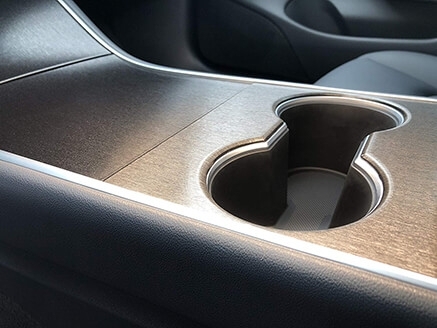 If you have a second car take a look in the cup holder. Point proven. 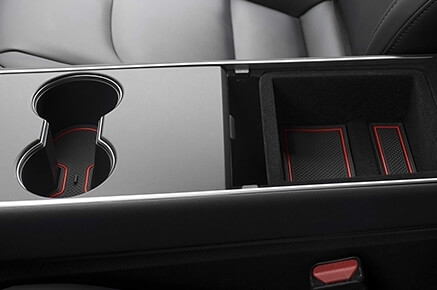 These center console liners sit inside your center console cup holder and compartments, sort of like a floor mat for your center console. This makes spills and other messes easier to clean up. In addition to solid black, there are 4 other color options if you want to add a splash of color. Let's face it, your dog is going to go for a ride in your new Tesla at some point. 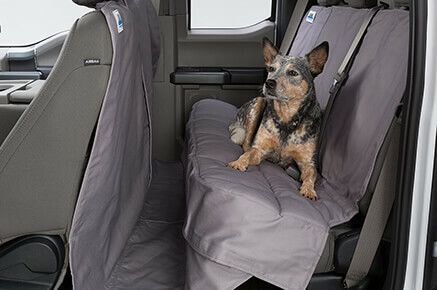 A seat protector keeps a barrier between your seat and your dog's hair and paws, helping protect your seats while making them easier to clean. We have both a universal seat protector option, as well as a fully custom fit option for the Model 3 if you want a little more coverage. If you just need standard protection, the universal option will be perfect for you. It's not needed for everyone, but if you live in a sunny and hot climate you already know you need one of these. These roll up with a velcro strap when not in use. When in use they can make a dramatic difference in interior temperatures, and help protect your leather from sun damage. This is specifically made for the Model 3. Driver Side Wiper Blade 26"
Self explanatory - sooner or later you'll need to replace your wiper blade. 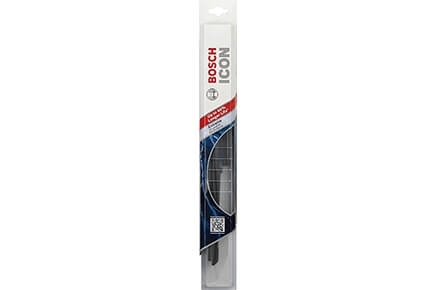 This is the replacement wiper blade you'll need for the driver's side. These are also sold in packs of 5 if you don't want to worry about ordering replacements down the road. Passenger Side Wiper Blade 19"
Same deal as above, except this is the replacement for the passenger side wiper blade. It might be handy to have a couple of these ordered, so you have them the moment you need it. Useful since the Model 3 doesn't come with a spare tire. 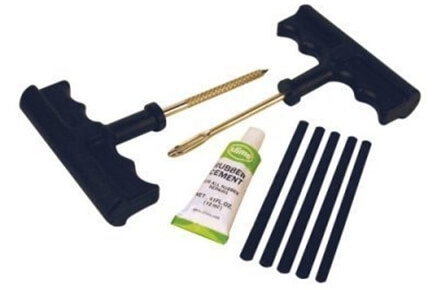 This handy tire repair kit repairs small punctures without needing to remove the tire from the rim. Remember to always get your tires checked by a professional after any repair. This should not be used for major tire damage. This is a great item to add to your 'emergency roadside' kit. A quick, easy and portable way to air up your tires when the pressure changes. This can be used for any of your vehicles, so keep this around the house if you don't want to run to your local gas station or tire shop just for a little bit of air. It also has an integrated LED flash light in case you need to air up at night. Keep this in your frunk and you'll be glad you did. 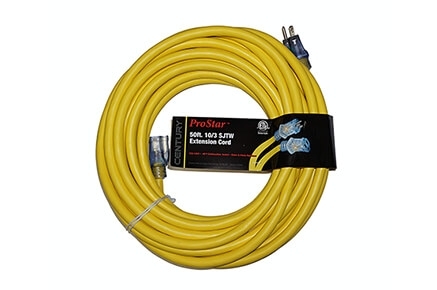 This long extension cord can help you charge up in random places when an outlet is hard to reach. If you find yourself at a friend or family member's house, on the road, or anywhere else without an EV plug-in solution and need a charge, this can save you. 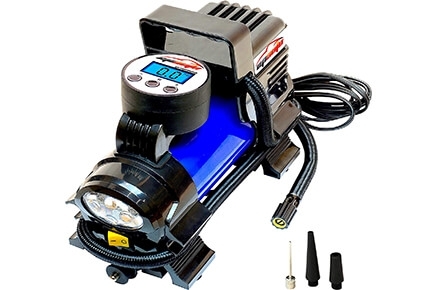 No batteries needed, just hook it up to a water hose. 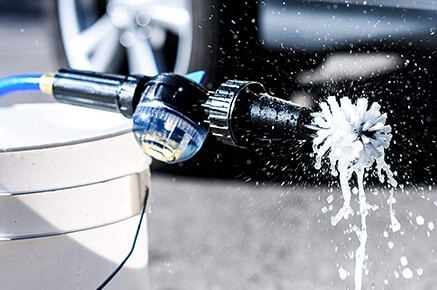 The Brush Hero wheel brush, detail brush and Soap Star hose soap dispenser will all work together to help give your wheels a good shine. This tool isn't designed to spin fast, but gives a steady torque that gets the grime off. One of the best cleaning tools out there. Self explanatory, for those Tesla owners that are obsessive about keeping their car clean! 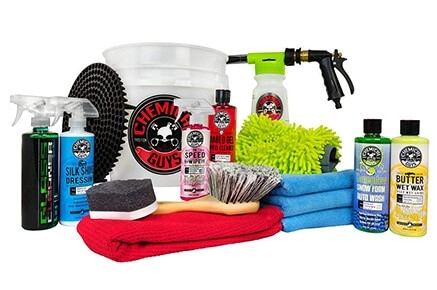 This includes everything you need for a good auto detail, including a bucket, soaps, waxes, glass cleaners, detailing sprays, buckets, microfiber towel, brush and more. This hangs next to your at-home charging station, allowing you to coil up the hose and with a spot to put the Tesla charging nozzle. This is one of the easiest ways to help keep your garage organized! If you have any suggestions for a Tesla Model 3 product or accessory, we'd love to hear about it! Please use our contact form here to let us know about your favorite accessory. While we sell some of the suggested products, there are some products on this list that we do not carry or do not intend to carry, but are available on Amazon. For these products we link to the associated Amazon page. PartCatalog is a participant in the Amazon Services LLC Associates Program, an affiliate advertising program designed to provide a means for sites to earn advertising fees by advertising and linking to Amazon. Prices quoted on this page are subject to change. The price we list on this page are accurate at the time this page is published. We do not provide any warranty or support for products not purchased directly from PartCatalog.